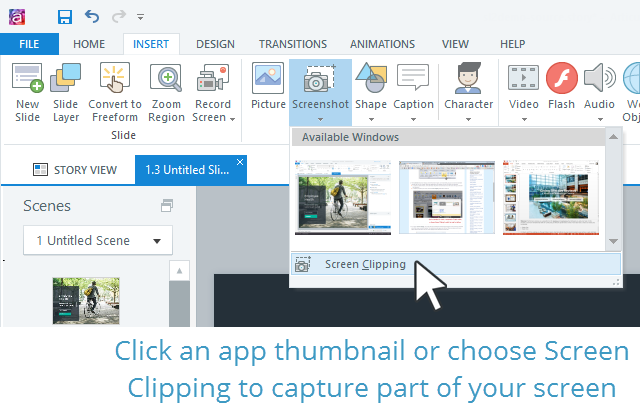 Articulate Storyline has a nifty screenshot tool for quickly capturing images from your screen. Here's how to use it. Go to the Insert tab on the ribbon and click Screenshot. To capture just part of your screen, choose Screen Clipping at the bottom of the list. If you chose Screen Clipping, your screen will dim and Storyline will temporarily disappear. Click and drag to select the area of the screen you want to capture. The selected area will appear non-dimmed. When you release your mouse button, Storyline will return, and your screen clipping will be added to the current slide.